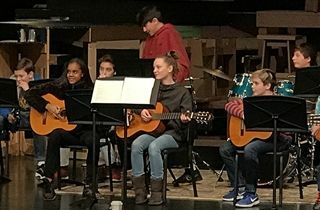 On February 11, the sixth grade music ensemble performed Bobby McFerrin’s “Don’t Worry, Be Happy” as the culmination of their trimester-long research into the evolution of African-American music. Featured instruments included guitar, ukulele, electric guitar, electric bass, drum kit, congas, bongos, hand percussion instruments, harp, keyboards, and solo voice. Congratulations to all on a very successful performance!